Type: AGM Deep cycle battery. Applications: Suitable for use with the Powerhouse Pro Range Golf buggy, and similar. Medium use. Life expectancy*: 150-250 Cycles depending on terrain and charger type. Duration: 18-27 hole capacity depending on terrain and user weight. Medium use. 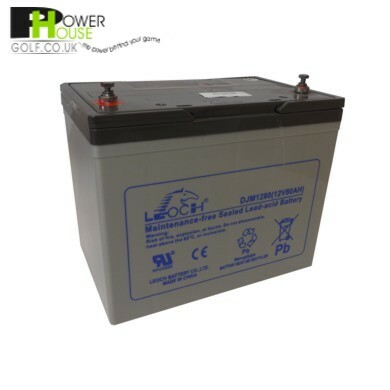 Features: High performance Deep Cycle batteries, with Ultra Deep Discharge recovery. Warranty: This battery comes with full 12 pro rata guarantee. Note* Life expectancy will be effected by Frequency of use, type of charger, payload and terrain. All our batteries are specially designed for Golf Buggies and Golf Trolleys. Please see our Battery FAQ's Page or our Charger FAQ's Page for more information on how to get the most from your Golf Trolley and Golf Buggy batteries. VAT is Exemption is available on this battery. In order to qualify for VAT Exemption on this battery, you must have originally purchased your Powerhouse Golf Buggy with Powerhouse Golf VAT Exempt. It is not possible to buy this battery VAT Exempt for second hand buggies or other branded buggies.